My mildly obsessive nature came in very handy this week. At least as far as my writing goes. On Sunday afternoon I found myself a few words (5 to be exact) short of hitting the 1,000 word mark for the day. So, I went back to the keyboard with the intention of writing a couple of paragraphs to hit that nice round 1,000 word number. I ended up writing for about half an hour. That brought me to within 100 words or so of the 45,000 word mark on The Zombie Book (working title). I then decided to make another little push to hit that milestone. 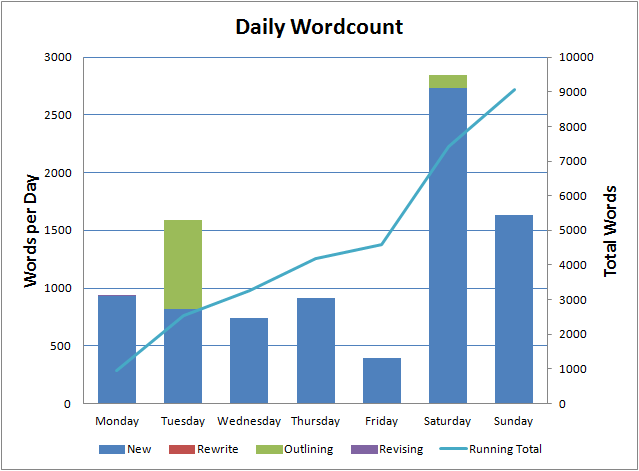 Having done that, I found myself just shy of 9,000 words for the week. Obviously, I couldn’t ignore that so I carried on writing. In the end, I managed 9,053 words for the week which, while not an actual word count record, is certainly in the top three. All those words were on the untitled Zombie Book. The outlining was where I sorted out the second half of the book, smoothing over the cracks created by me veering off the outline during the first half. There’s still one subplot that doesn’t flow quite as neatly as I’d like but I’ll deal with that once the book is finished. Which should be about 30,000 words from now. Not sure how long that will take, I have edits on a novella (Leah) and an idea for a new short story that I’d like to work on. My goal is to get all three finished by the end of October.